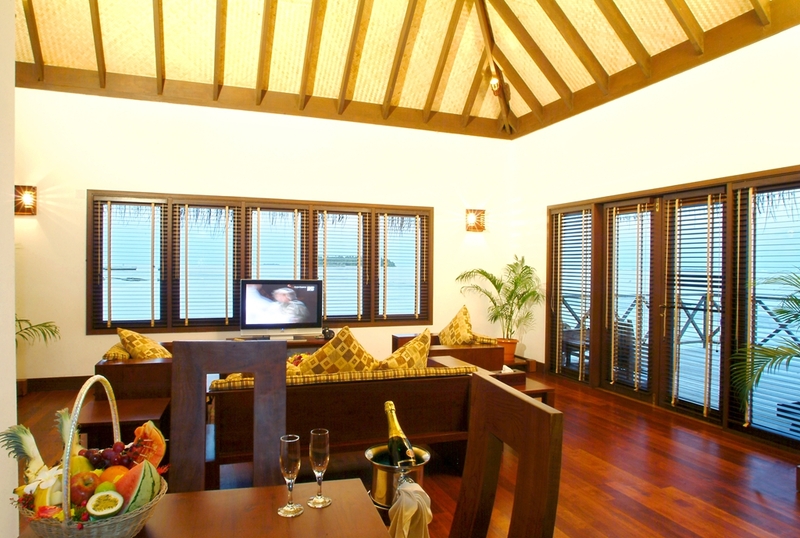 The Water Villa, our elite package, features unique decor and breathtaking views of the ocean and beach, giving you the feeling that your villa is floating on the ocean. 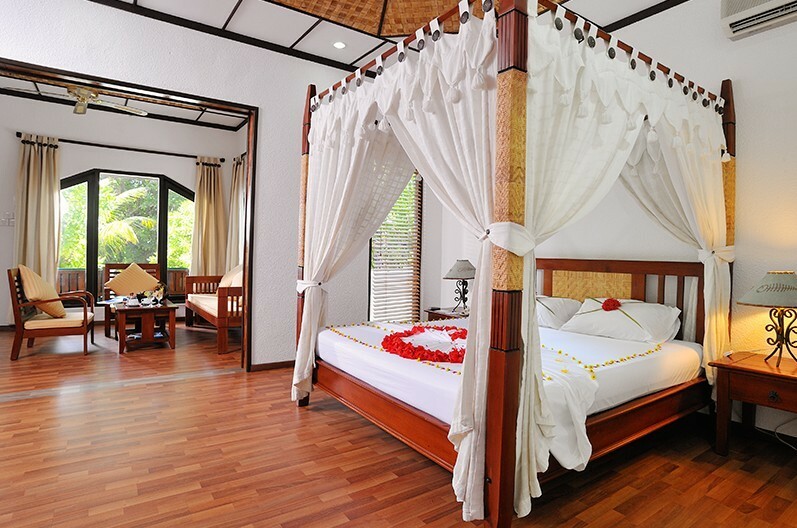 It offers luxury and tranquillity with full privacy and services exclusive to the villa.The living quarters come fully furnished with modern amenities, while the defining feature of the bedroom is the ornate four-poster bed whose elegance is certainly worthy of royalty. 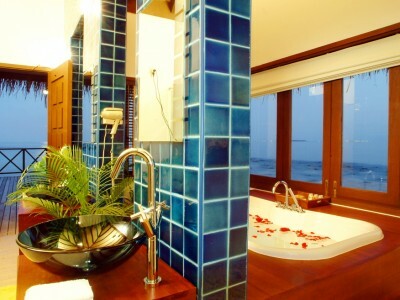 The ultra-luxurious and roomy Jacuzzi, set amongst lush tropical indoor plants and imported river pebbles, affords one an uninterrupted view of the ocean and the unending horizon.At Bandos Water Villas, one can simply while away many a moment on such simple pleasures as enjoying the sunset, a romantic soak with a loved one or, as they say in these isles, mastering the art of doing nothing. 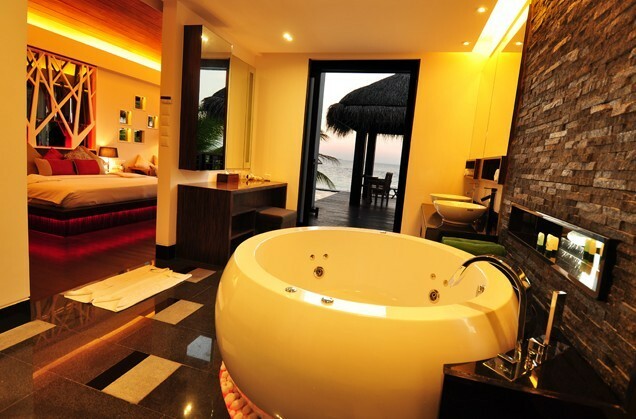 Set on a strip of white sandy beach overlooking a crystal-clear lagoon blessed with abundant sunshine and tropical flora of unspeakable beauty, the Jacuzzi Beach Villas at Bandos will singularly make your stay on Bandos a most memorable occasion. Fashioned as a duplex, the living and bedroom facilities boast of all the requisite amenities necessary for your comfort and satisfaction. 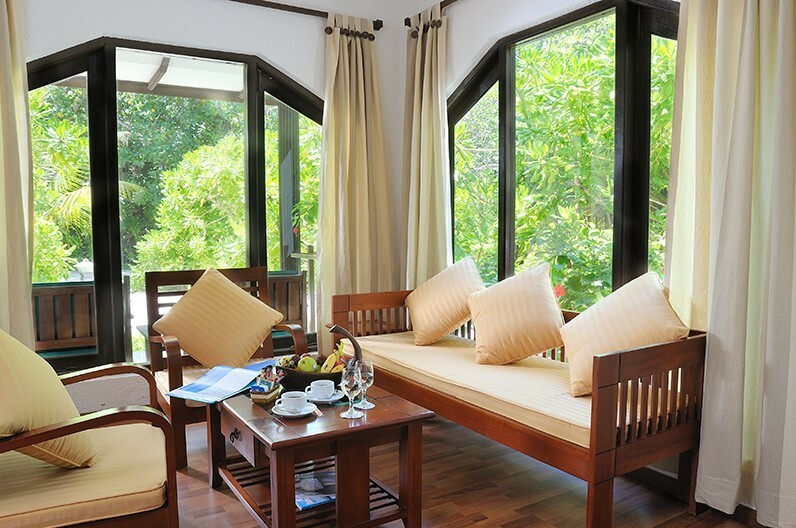 The balcony provides a pleasant view of the beach front, while the gentle rumble of the surf is constantly soothing. 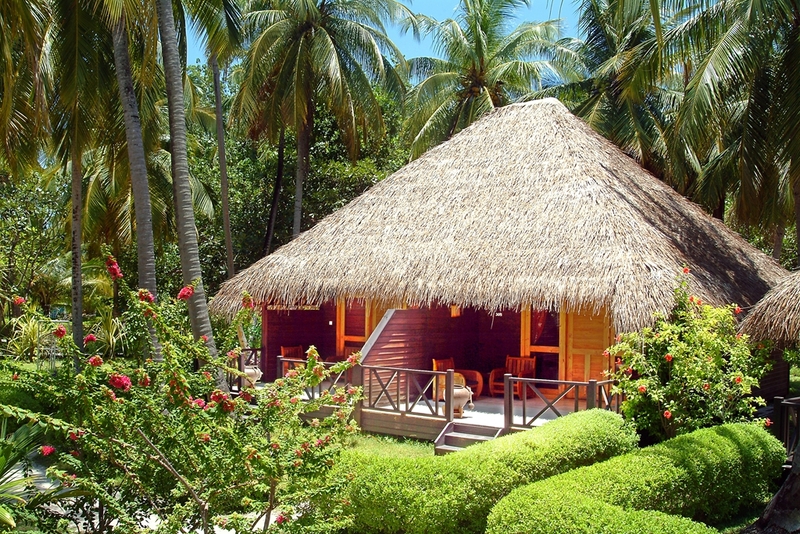 In the seclusion of your Beach Villa, surrounded by lush tropical vegetation, is the open-air Jacuzzi with its thatched roof shade designed for your relaxation and enjoyment. 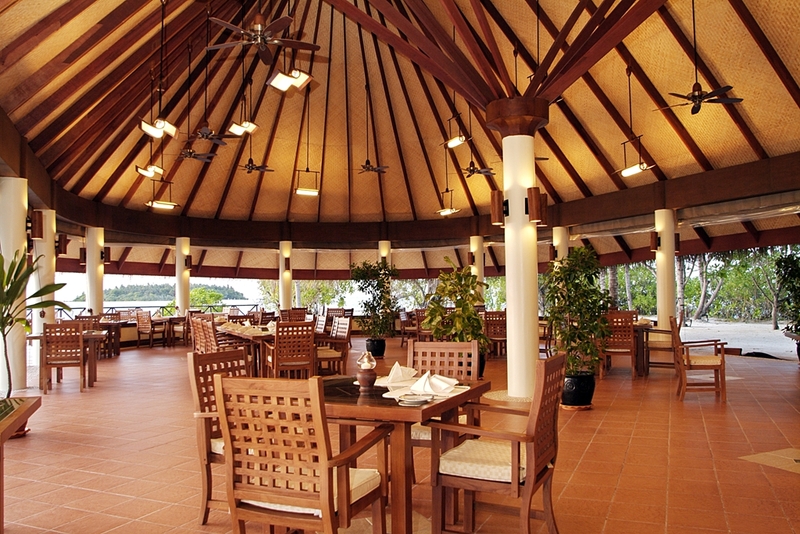 The elegantly designed Koon Thai Restaurant overlooks the lagoon, and offers guests a range of Thai cuisine. 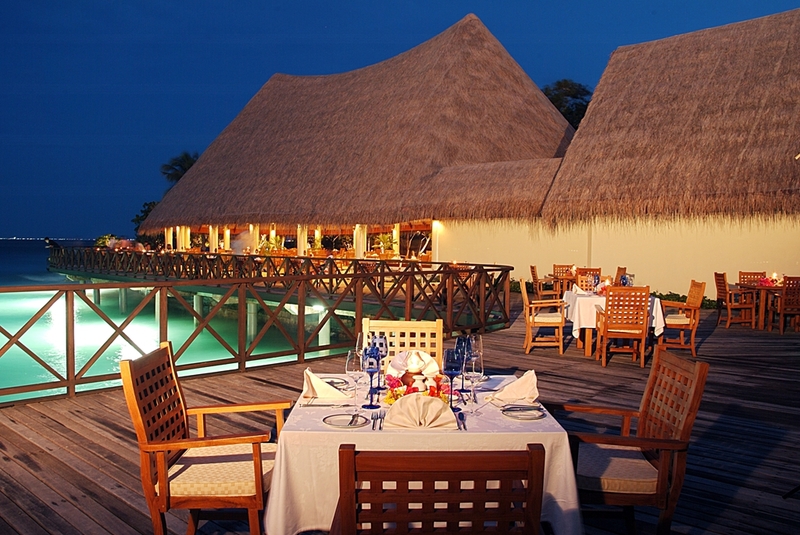 This restaurant provides you with the choice of dining either indoors, in a comfortable air-conditioned atmosphere, or outdoors where you can savour the view and gentle breeze. Carefully prepared by passionate chefs, each culinary delight at Koon aims to awaken your taste buds while offering palatable and authentic Thai flavours. The dishes can be accompanied with a selection of fine wines from some of the world’s reputed wine regions. 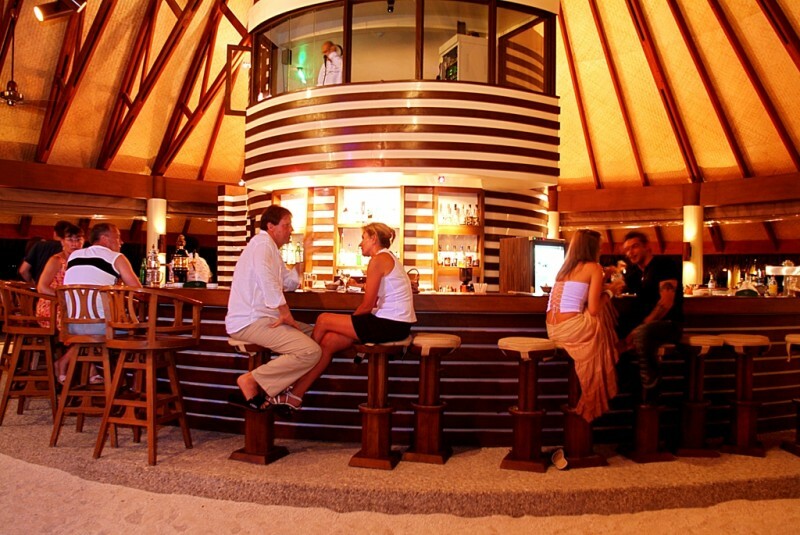 As a classic island-beach bar, the Sand Bar’s modern facilities blend well with the tropical atmosphere. 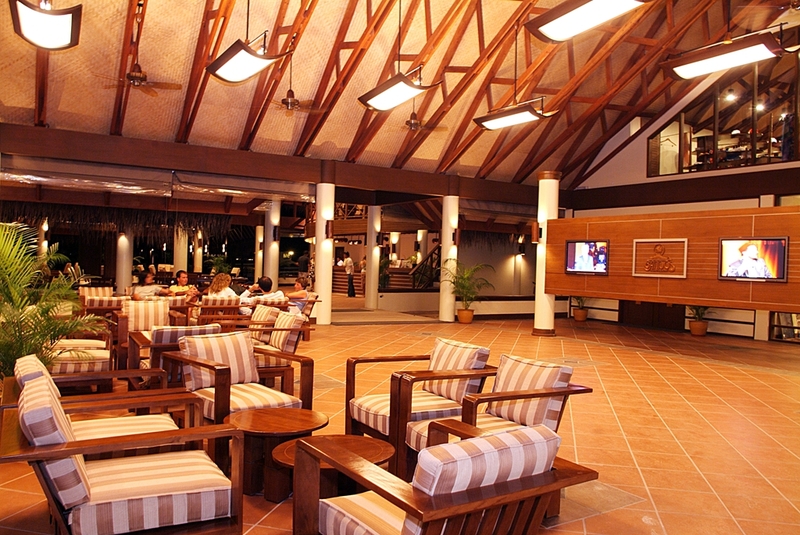 The sand floor and island ambience of the bar is ideal for customers to enjoy one of our many tropical cocktails or any other beverage that suits their fancy. The Sand Bar is designed with fun in mind and we assure you that our guests would have a wonderful time either with our top-notch karaoke facilities, live band or discotheque evenings. 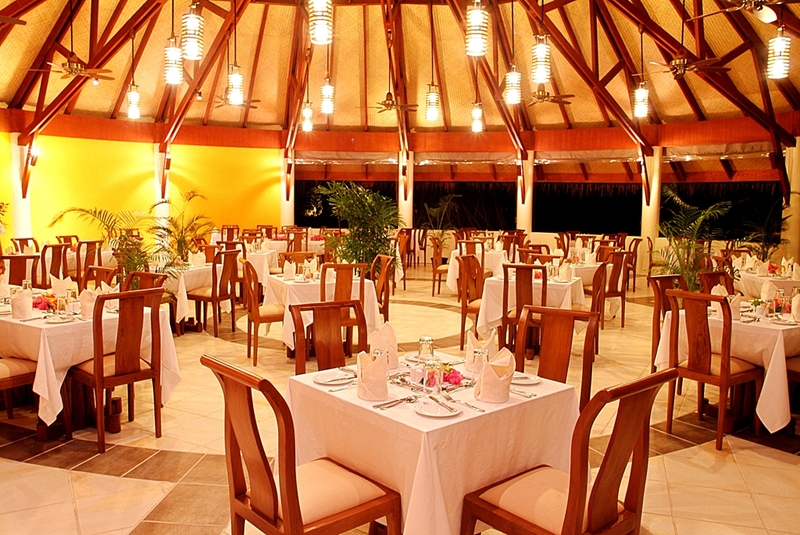 The Gallery, consisting of three spacious pods, is open for breakfast, lunch and dinner, and is the main restaurant at Bandos. 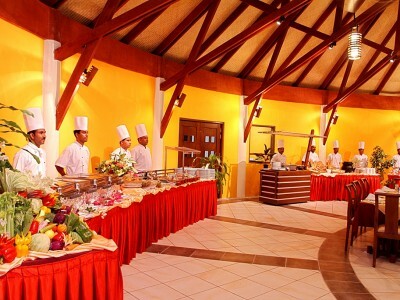 It usually has elaborate buffet setups during mealtimes and although open to all guests, the Gallery specializes in catering to those who have pre-booked their meals. Guests who have pre-booked their meal arrangements are also welcome to patronize our other restaurants and are eligible for discounts at both the Koon Thai Restaurant and Sea Breeze Cafe (Coffee Shop). 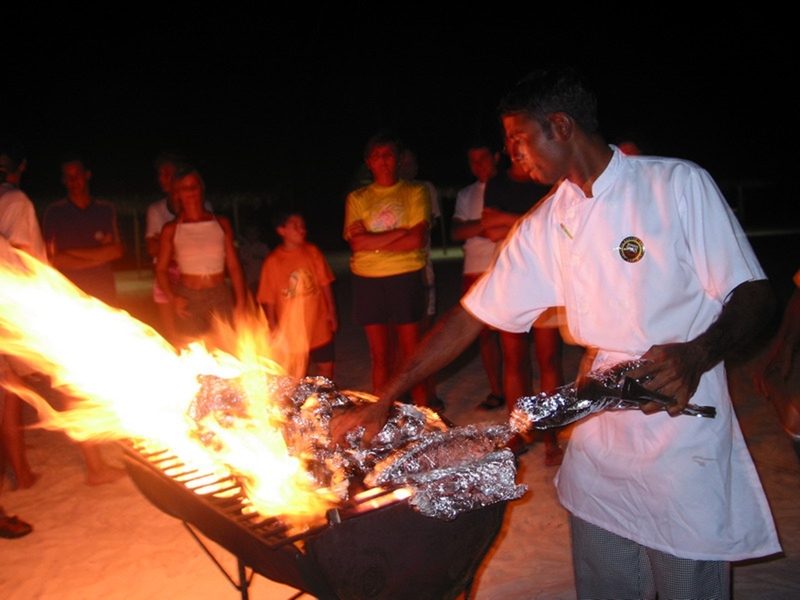 To make your holidays enjoyable at Bandos Island Resort and Spa, and to help you discover the magic of Maldives, We have designed an exciting range of excursions. 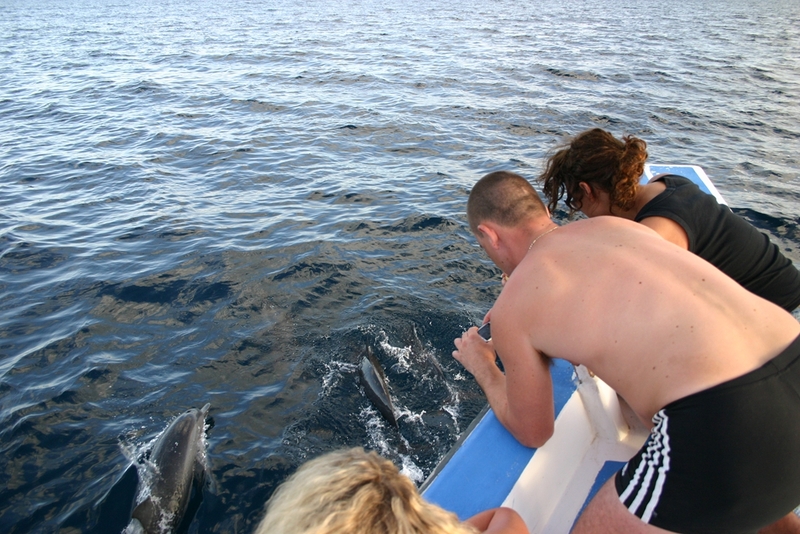 Some of these include Island Hopping; Mal’e Shopping;night fishing with Kuda Bandos Barbeque;and the Sunset Dolphin Cruise. All our excursions are carefully selected for specific days of the week, tailored to guest travel patterns and other external factors. 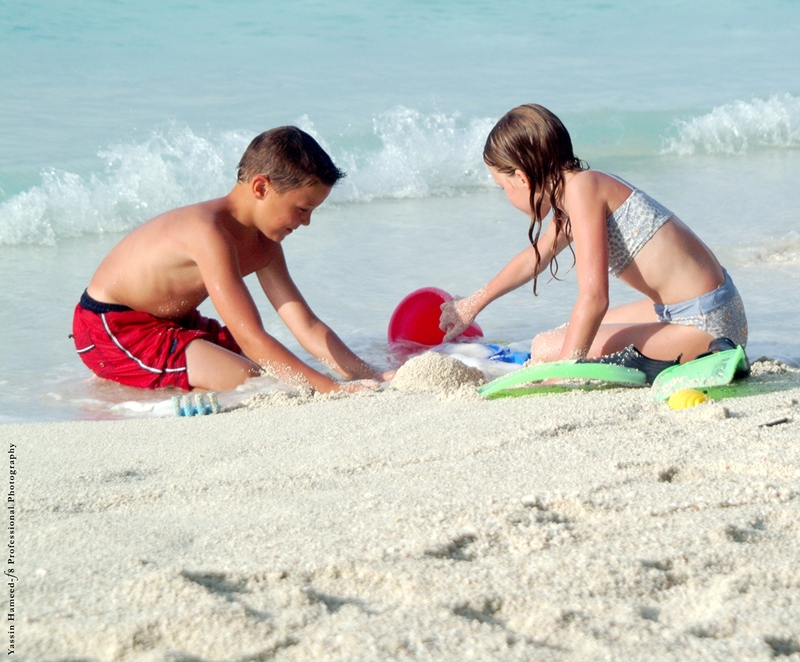 At Bandos we think of making your holiday as hassle free as possible, and for those families travelling with young children the Child Care Centre and Kokko Club will prove to be a blessing. Now you can enjoy your holiday comfortable in the knowledge that your children are in the capable care of our professional child minders and baby sitters. The Kokko Club (Kids Club) open from 0800hrs to 1700hrs, Monday to Sunday offers a wide variety of activities for kids and teens. The club accepts children aged 3 – 12 years old free of charge , children aged 1-2 years old with-out adult supervision will be charge for babysitting services. We create and maintain a safe, healthy and exciting environment where they can enjoy, explore, learn, socialize with other kids and have fun. We strive to stay up to date with the ever changing needs of our young guests, most whom we are fortunate enough to see every year from their infancy. The facilities are free of charge and the associates of Kokko Club provides baby-sitting services chargable on a hourly basis for all ages. The Kokko Club is equipped with a nursery full of toys and a large playground outside so that even your children would be guaranteed an enjoyable holiday experience. 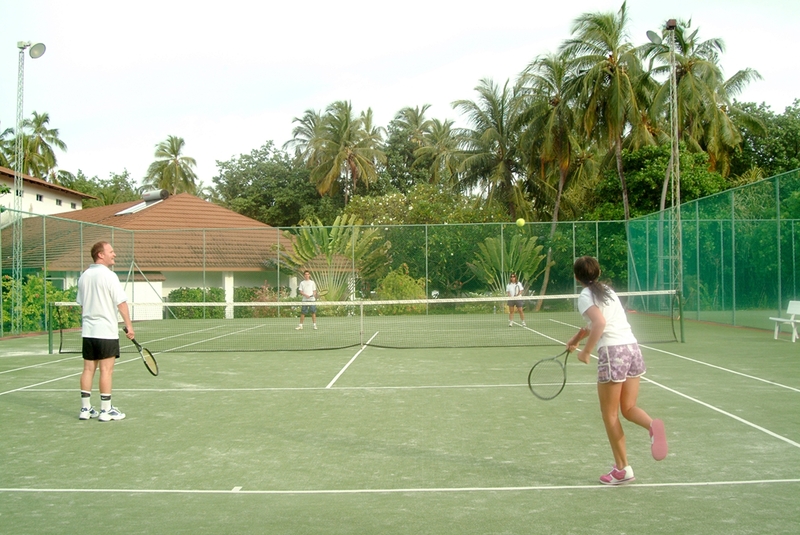 For those guests who seek a more professional path to keeping fit or even relaxing, the sports complex at Bandos, Paradise Club is the answer to keeping fit both physically and mentally. 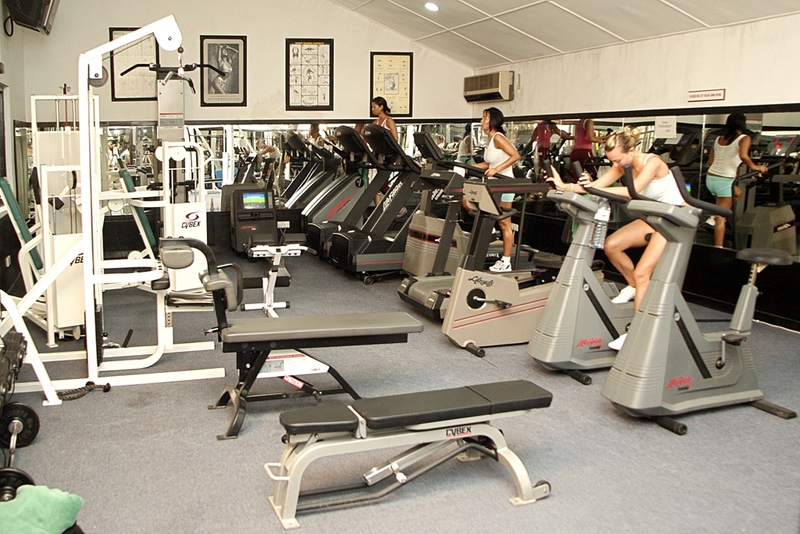 Our gymnasium, equipped with state of the art equipment and our qualified friendly instructors, are open to all our guests free of charge. Come on in and enjoy beach volleyball or tennis in our flood-lit courts. For those wishing to take it a bit easier, One can also lounge about in our TV room where we feature major news, sports and entertainment channels. Also featured are table tennis and board games. 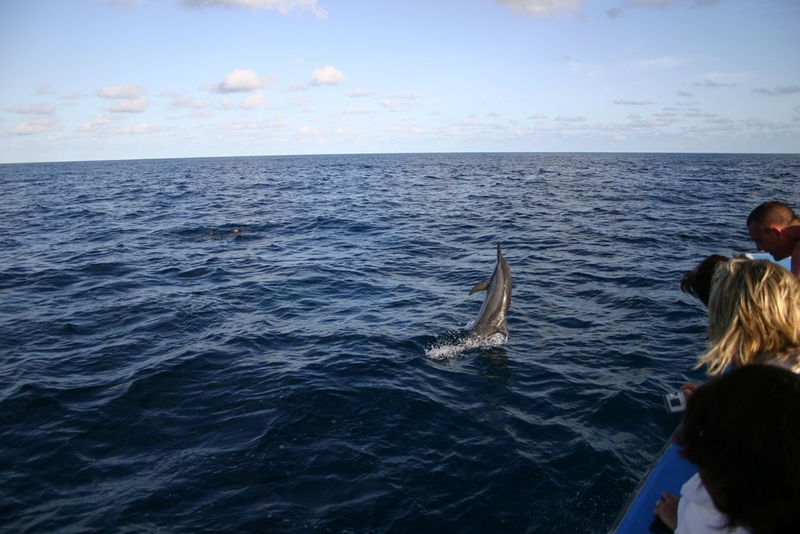 In a country that is more water than land, the possibilities for fun-filled activities in the water are almost inexhaustible. 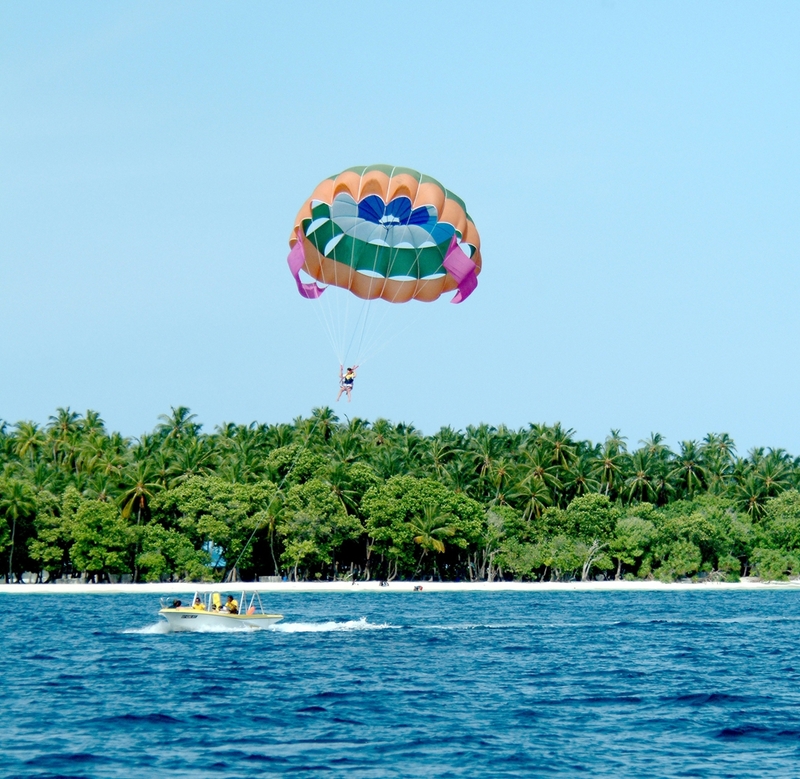 Whether it is the turquoise of the lagoon, or the azure blue of the rich coral reefs, or even the darker blue of the ocean, the waters surrounding Bandos will certainly yield some recreational value for our guests. 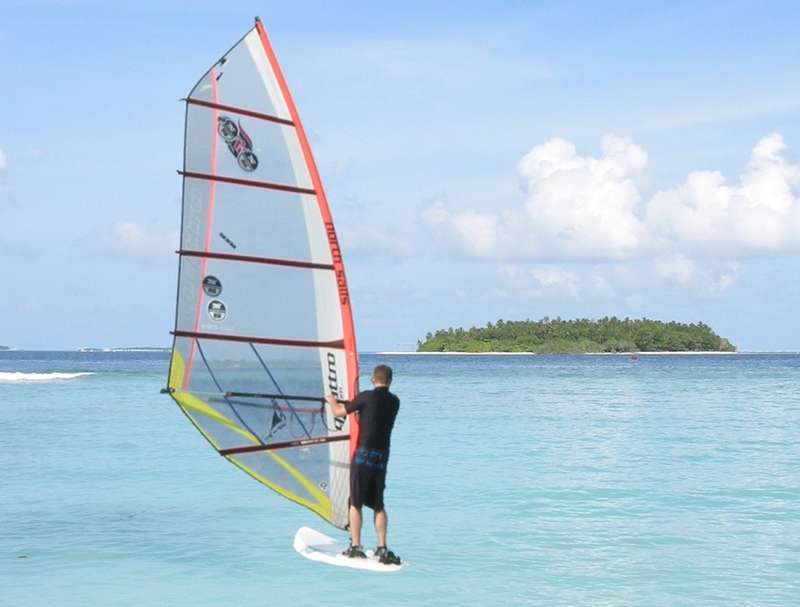 The water sports centre at Bandos is associates ed with professionals who are highly skilled in their craft and are fluent in English, Japanese and German. 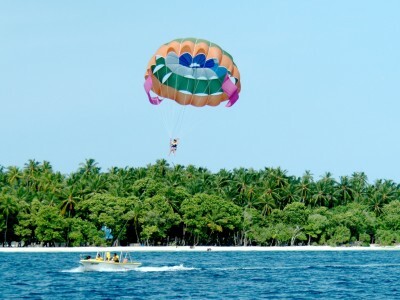 Some of our most preferred activities include snorkelling, windsurfing, catamaran sailing, water skiing, parasailing, banana boat riding, wakeboard, knee board, fun tubes and canoeing. What’s important to note here is that this is not an exhaustive list and the possibilities are most certainly unlimited. The Water Sports Centre here at Bandos also offers top notch catamaran and windsurfing facilities, while boasting of quality equipment such as Hifly, North-Sails and Topcats. 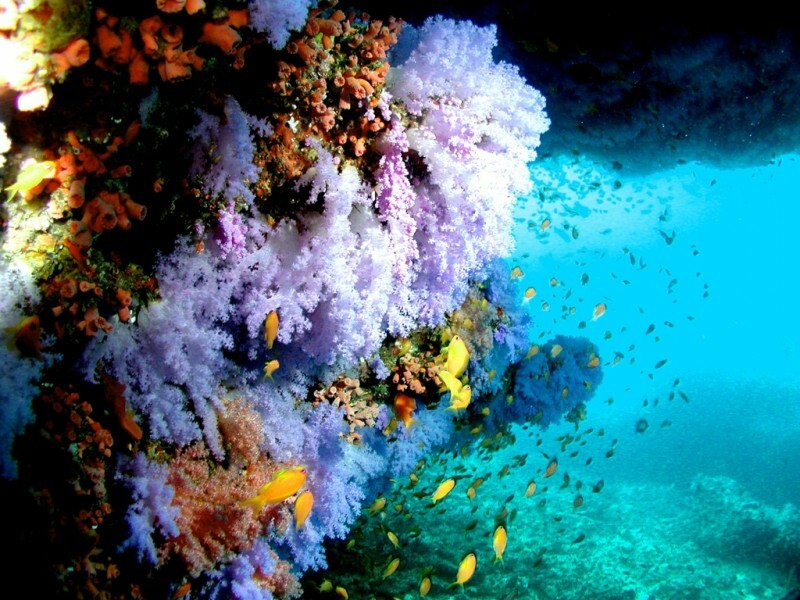 We can also organise snorkelling trips to our house reef where, surrounded by the beauty of brightly-coloured coral formations and other underwater flora, you will have the opportunity to mingle with multi-coloured tropical fish. Try out your voice on our Karaoke Nights at the Sand Bar. We offer a selection of well known songs from A-Z artists. View the lyrics on our big screen, while you hide in your chair and sing out your heart with that beautiful voice within! It’s not a pressure filled atmosphere; it’s a free, independent and friendly one where you’ll never feel alone, even without a partner! Do not miss the chance to check out our best bands perform live on our stage when they show off their stunning musical talents. Performances of Jazz, Blues, Pop and Rock twice a week at our Sand Bar where all the entertainment takes place. 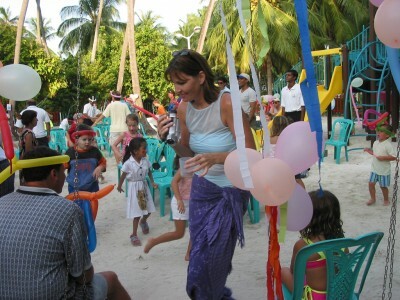 Other programs include Maldivian Cultural Night with traditional drums and dances, Disco Night, Crab Racing Event, Dive Show and Movie Nights. 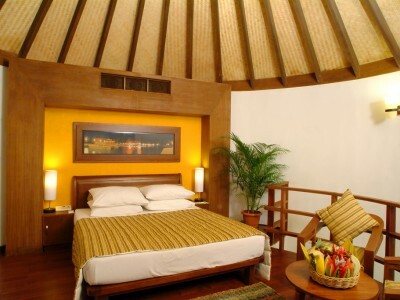 •	Rooms are very stylish and modern, design of rooms are different. All rooms after renovation. So even first categories are very good! All rooms are very spacious. Ekonomik diyebileceğimiz kategoride yer alan bu resort müşterilerine kaliteli ve pek çok olanakların sunulduğu bir hizmet sunuyor. Kuruluşunun 42. Yılını kutlayan bir yer ve dolayısıyla bu kadar yıldır ayaktaysa çok tercih edildiği içindir zaten. Önemli bir not burası için; Maldivler’de 3 basınç odası var ve bunlardan bir tanesi de Bandos Island’da. Dalış yapanlar için önemli ve bu noktayı atlamamak lazım. Ayrıca odaların mimarisi çok hoş.İçinizi ferahlatan bir döşeme ve ada hayatına uygun görüntü de yine bu adada karşınıza çıkıyor. 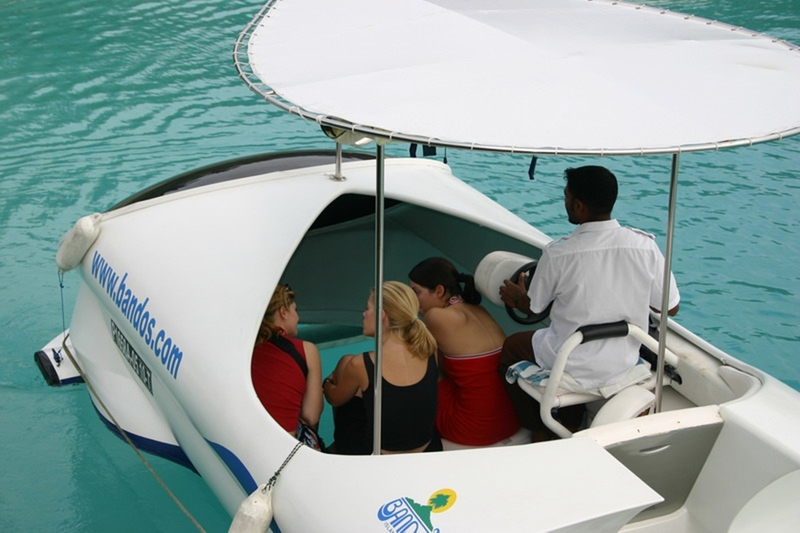 Just a 15 minute ride by speed-boat from Male, Bandos Island is a convenient budget resort in Maldives. 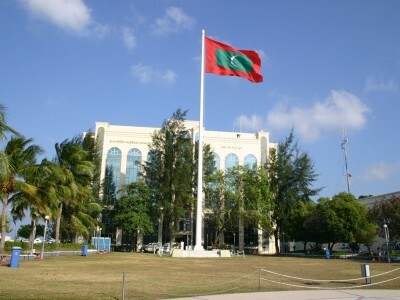 It is known as a place that started the concept of resort tourism in the country; being the second resort in Maldives. 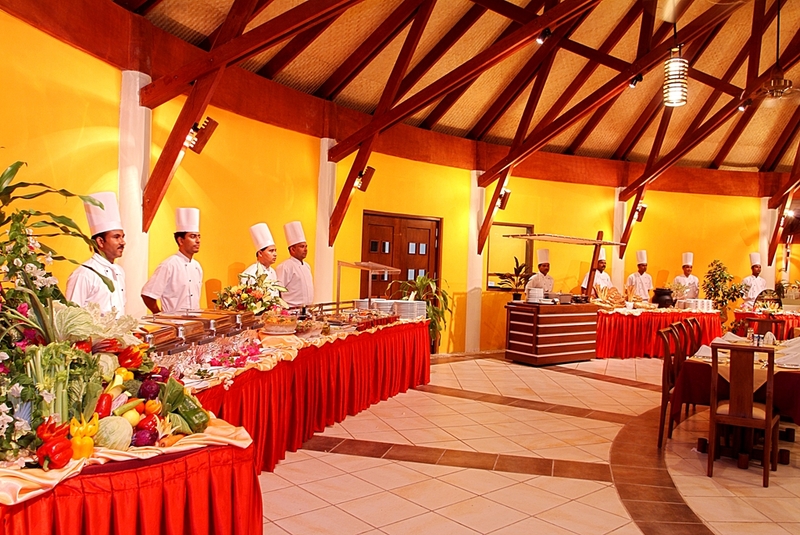 With many years of know-how and experienced staff, it is a well-managed place. 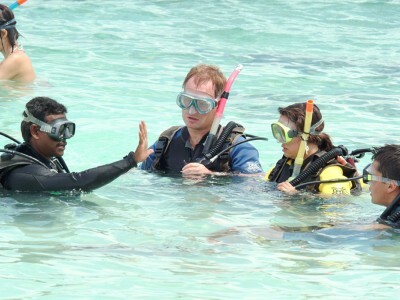 One important point here is that, Bandos Island Resort holds the very first scuba diving school in Maldives. 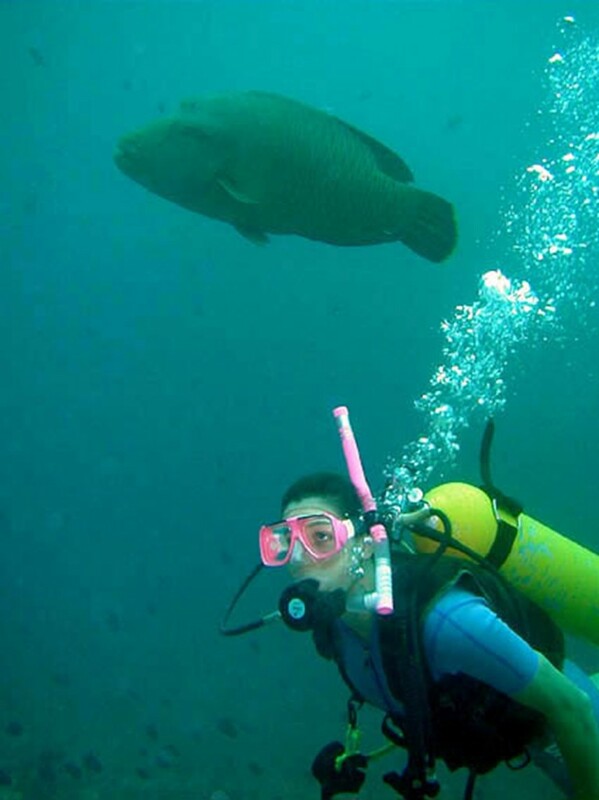 The country being very well-known for its colorful, amazing, lively underwater life, this resort is very experienced to serve their guests for training and assisting underwater. They also hold one of the 3 recompression chambers in whole Maldives, for divers who might have problems due to pressure. 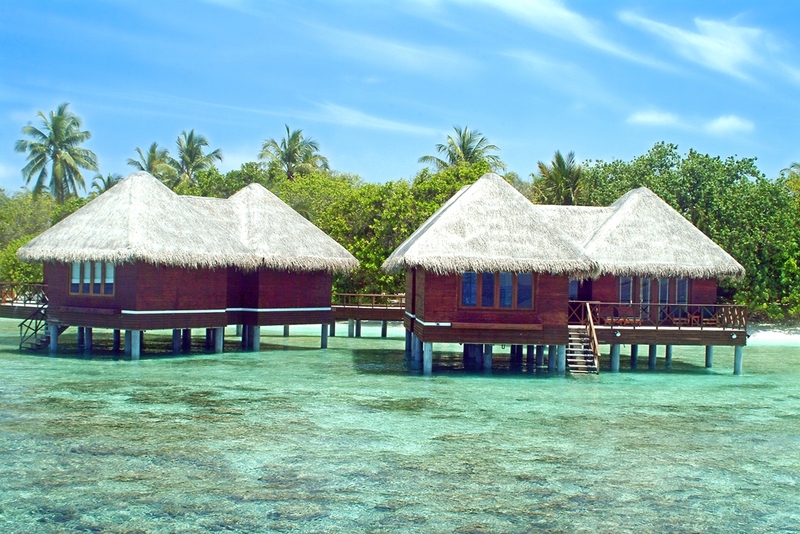 Having different accommodation choices and plans, they have rooms for as low as 200USD+tax going up to +1000USD+tax for water villas. 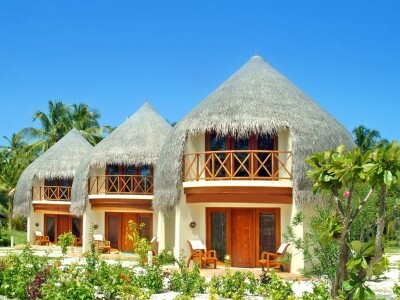 Villas are usually preferred by honeymooners whereas young divers prefer to stay at budget rooms. 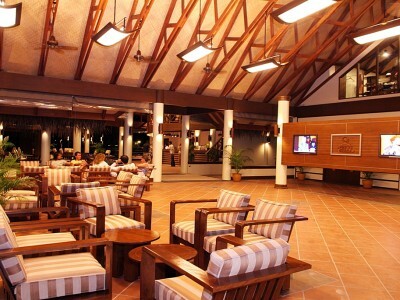 If you stay at least 2 times in this resort, you are qualified as a ‘repeater’ and are welcome to join their ‘repeaters party’ every Wednesday evening during your stay, to meet with fellow repeaters. The turquoise of the lagoon, lush green vegetation, pearl white beaches, azure blue sky and abundant golden sunshine create a feeling of perfect tranquility. 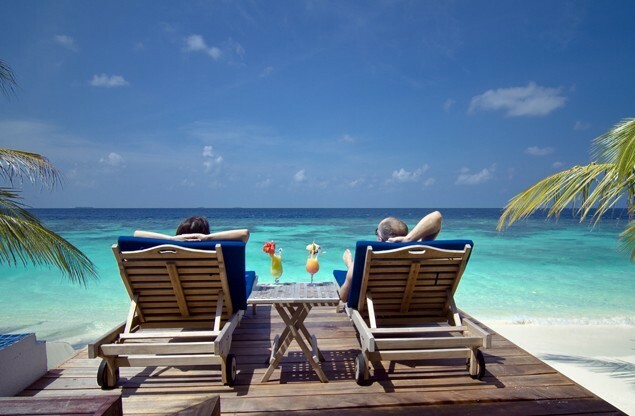 Everyday stresses will melt away as you are transported to a haven of pure calm and serenity.From the moment you arrive you will receive a warm Maldives welcome and the friendly, attentive service. 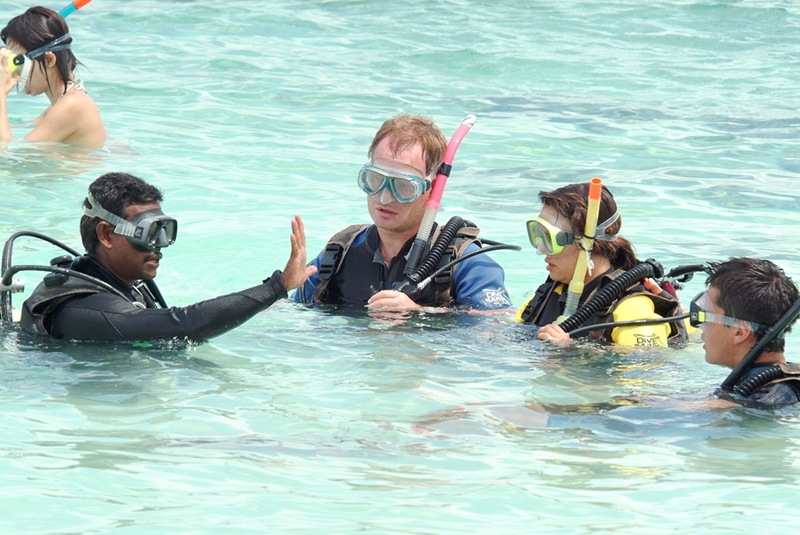 They have professional managed dive center and water sports,Guests have the benefit of their Dive Centre with professional staff who will guide them on an exploration of the spectacular underwater world of the Maldives and their Medical Clinic with a decompression chamber for complete peace of mind. Kids cub and Pool area well designed for children..
Must activites for this place,Snorkeling around the water center area,best place in the island(great house reef)Spa Treatment,Bottom Glass Boat,Watching Local Music Show and hookah with tropical flavour in the front beach area near the Main Restaurant. Good ratio between prıce and quality,great possibilities for snorkeling,house reef is very good,full of corals so there are not possıbilities to swim simply.Beach is with some elements of privacy,very good accomodation.Meal is good but not so variety. 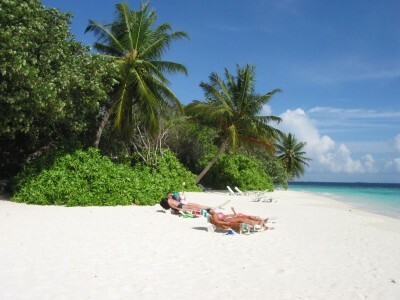 Bandos suitable as a budget Resort, very close to Male international Airport , 15-20 Min by speedboat, Natural Beauty so exiting and wonderful,for snorkeling,house reef is very good,full of corals,you have a lot of moments for privacy on beach. 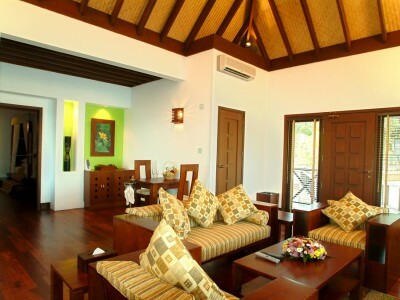 Variety rooms categories, The one highly recommended is the Jacuzzi Beach Villa,Jacuzzi Pool Villa and Water Villa. Restaurant and bar offering good variety cuisine as well own Thai restaurant for Dinner. 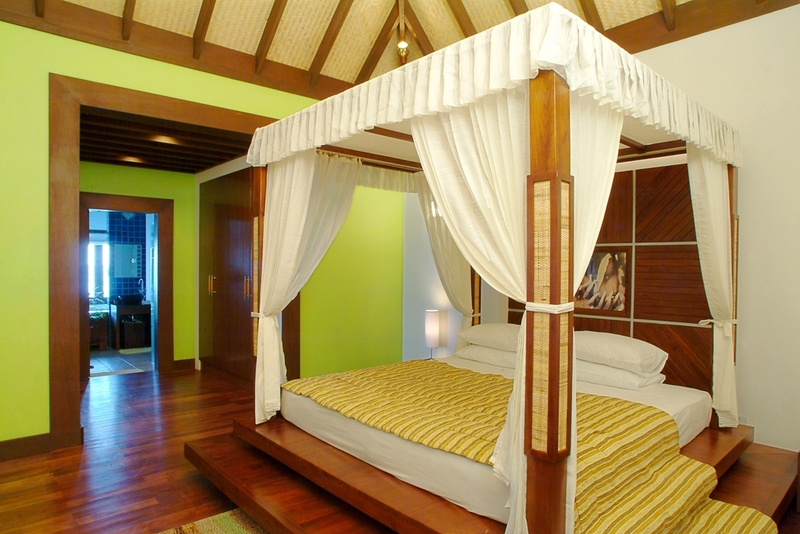 recommended for all type of clients Families,Honeymooners and couple. Bandos Island Resort & Spa – один из популярных и самых старших островов на Мальдивах, функционирует 45 – ый год. Расположен в 8 км от международного аэропрота Велана, 15 минут на скоростном катере отеля. Отель отличается с годами наробатанным широким спектром возможностей в организации отдыха. Богатая инфраструтктура острова не заставит гостей скучать. Представлены, практически, все виды водного спорта, в том числе и submarine (подводная лодка со стеклянной крышей). На острове, даже, есть мечеть, что несвойственно для других островов резортов. В спортивном клубе House предлагается широкий спектр занятий фитнесом, включая тренажерный зал, аэробику, бадминтон, теннисные корты, сквош и настольный теннис. В детском клубе Kokko организуют услуги няни и проводят различные программы для малышей. Для детей, также, имеется открытая игровая площадка, со скалодромом и мини футбольным полем, что не может не вызвать умиление. Следующими преимуществами отеля являются – красивая ухоженная территория, очень пышная густая растительность и хороший домашний риф. Несмотря на возраст отеля номера , довольно, в хорошем состоянии. Некоторые из них покрыты высокой соломенной крышей или отделаны деревянными элементами. В некоторых номерах имеется гостиная или джакузи на открытом воздухе. Есть двухэтажные виллы (Jacuzzi Beach Villa) с балконом с видом на индийский океан. На территории работают несколько ресторанов. Предлагается азиаткая и европейская кухня. Для гостей, рано прибывших на остров, либо поздно выезжающих, отель предусмотрел комфортабельный lounge c душевой и даже мини библиотекой, пользование бесплатное. Из замеченных недостатков выделила бы чрезмерную близость к аэропорту и столице Мальдив Мале. Нет ощущения нахождения на необитаемом острове, соседние острова видны очень отчетливо. Но здесь выгодное соотношение цены и качества, и отель адаптирован ко всем категориям туристов, от мала до велика. 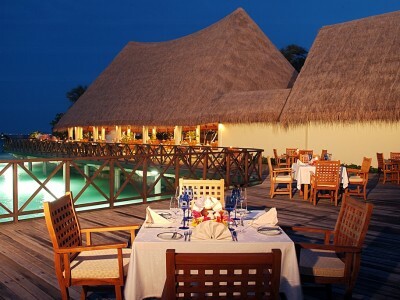 Bandos Island Resort & Spa – one of the most popular and oldest islands in Maldives, 45 years old. 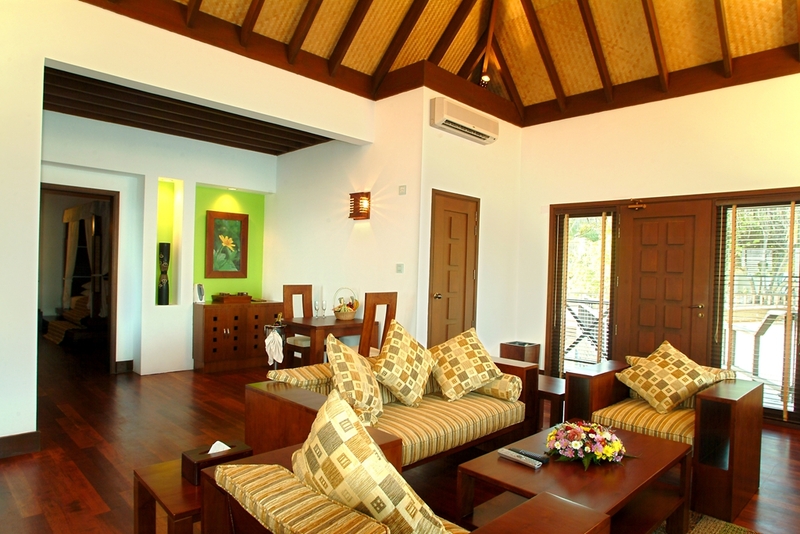 It is located 8 km from the international airport Velana, 15 minutes away by speed boat. 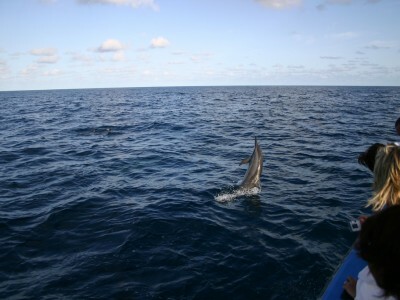 The hotel provides with wide range of opportunities for recreation. The island’s rich infrastructure will not let guests get dull. Almost all types of water sports, including submarine are available on the island. There is even a mosque, which is not common for other resorts. The Sports Club House offers a wide range of fitness activities, including a gym, aerobics, badminton, tennis courts, squash and ping pong. The Kokko children’s club arranges babysitting services and conducts various programs for toddlers. There is also an open area playground for children, with a climbing wall and a mini football field. 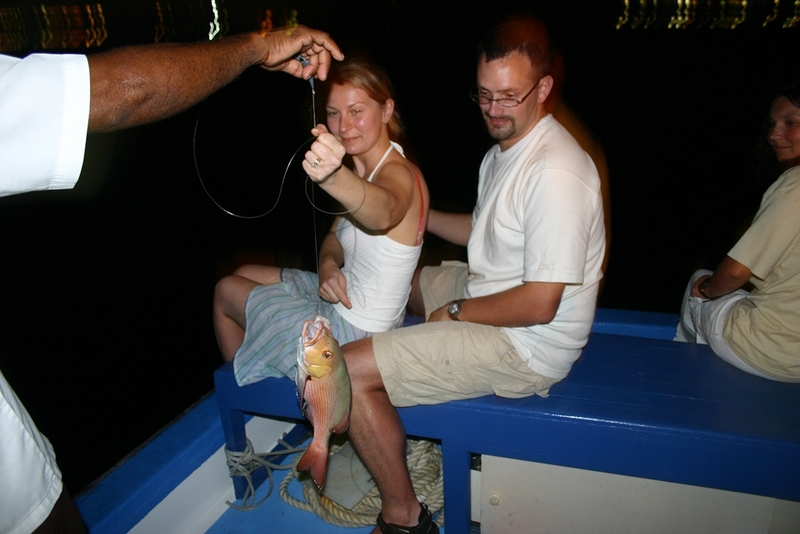 The next advantages of the hotel are – a beautiful well-groomed area, very lush, dense vegetation and a good house reef. Despite the age of the hotel, rooms are quite in a good condition. 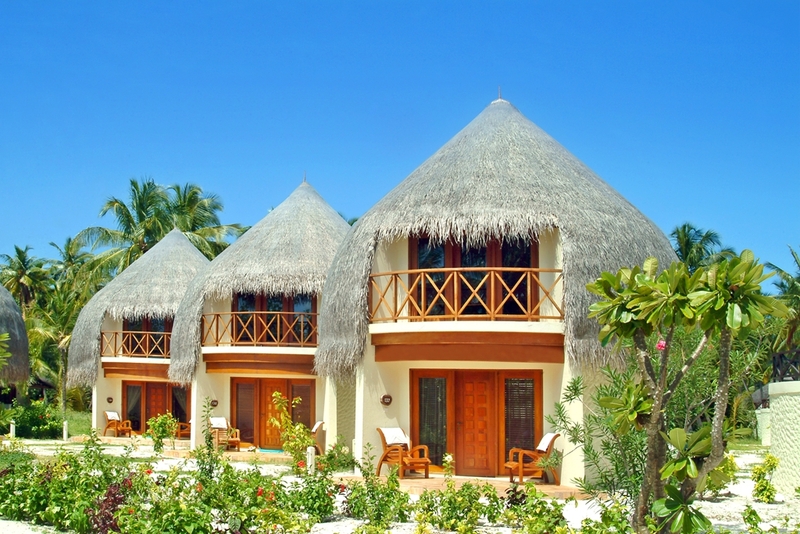 Some of them are covered with a high thatched roof or trimmed with wooden elements. 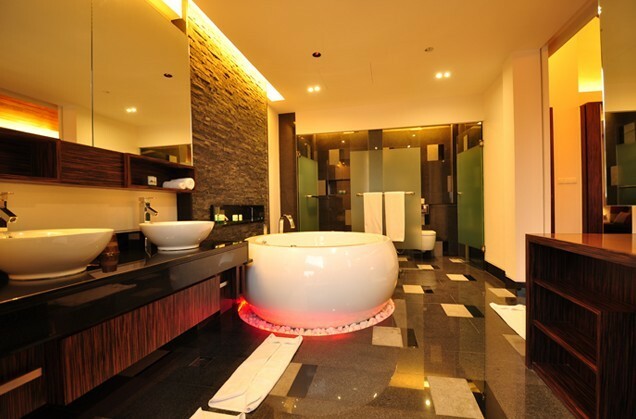 Some rooms have a living room or an outdoor jacuzzi. 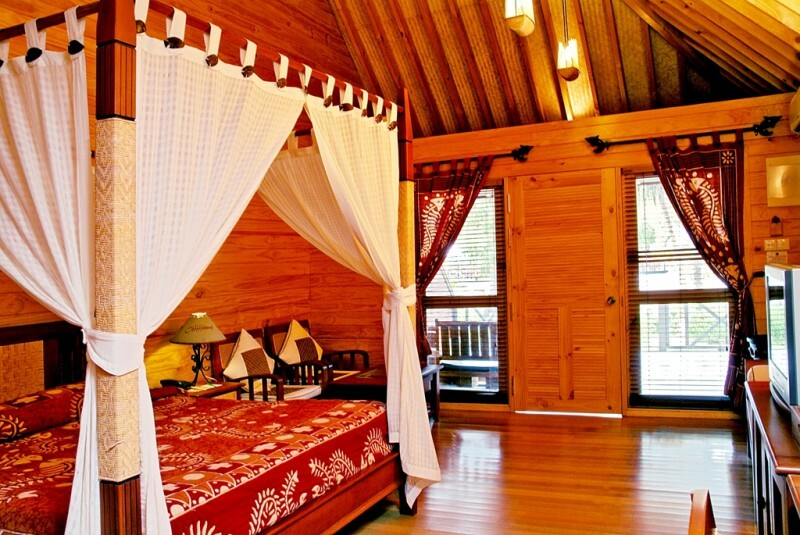 There are two-storey villas (Jacuzzi Beach Villa) with a balcony overlooking the Indian Ocean. There are several restaurants on the territory with Asian and European cuisine. For guests arriving early or departing late, the hotel provides with comfortable lounge with a shower room and even a mini library, use is free of charge. 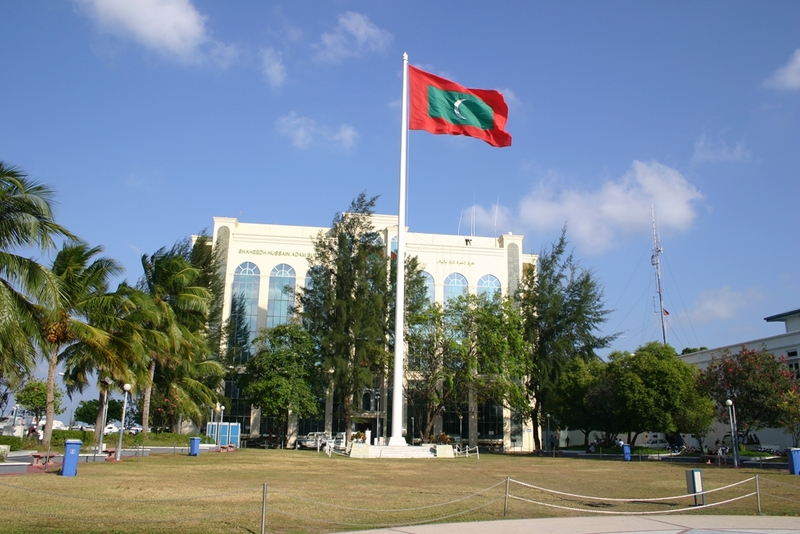 The only shortcoming I would highlight is the location of island which is too close to the airport and capital of Maldives – Male. 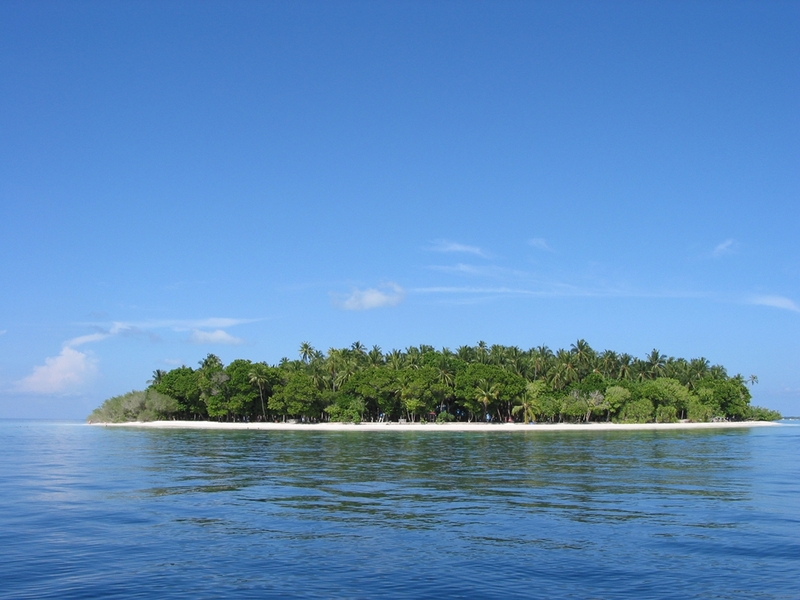 There is no sense of being on a desert island, the neighboring islands are visible very clearly. But here the advantageous ratio of price and quality, and the hotel is adapted to all categories of tourists of all ages. Bandos Island is very accessible as it is just 15 minutes away from the airport via speedboat. 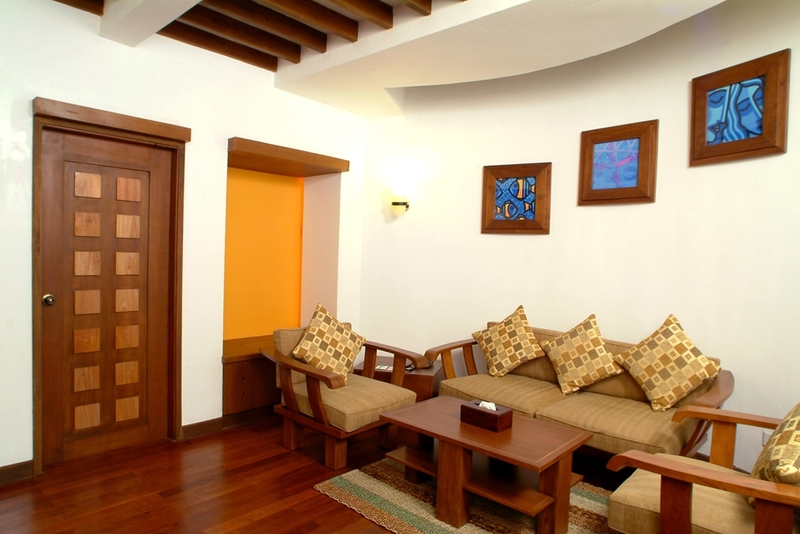 Whilst checking in – guests will not queue on the counter instead they will be sitting at the cozy reception area. Welcome drinks will be served and the receptionist will be the one approaching them. 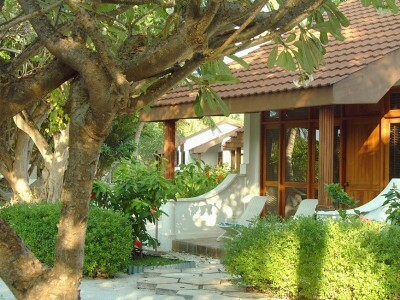 I think that is very hospitable and accommodating because guests are surely tired once they reached the resort. 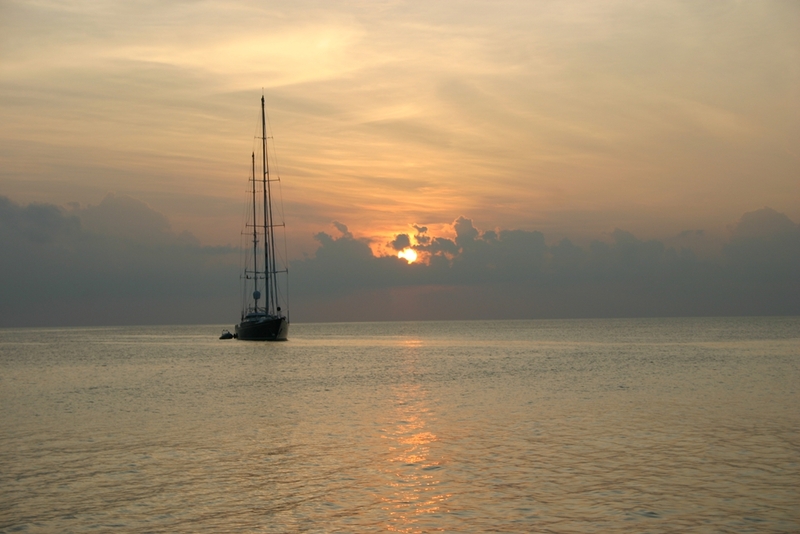 The natural beauty of the island is stunning. 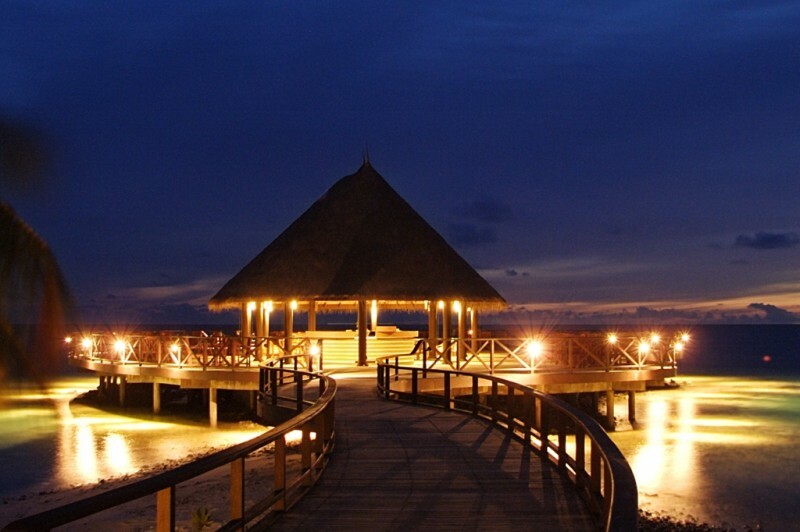 Bandos is the second resort to open in Maldives but the people conserve and protect the sanctuary. 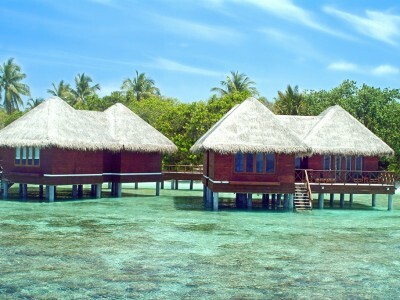 To protect the reef, they only built 2 water villas. 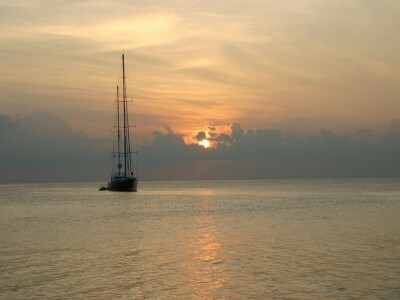 One of the proof that preservation of the island is the priority of the Resort and not just profit. The island is very serene and quiet. 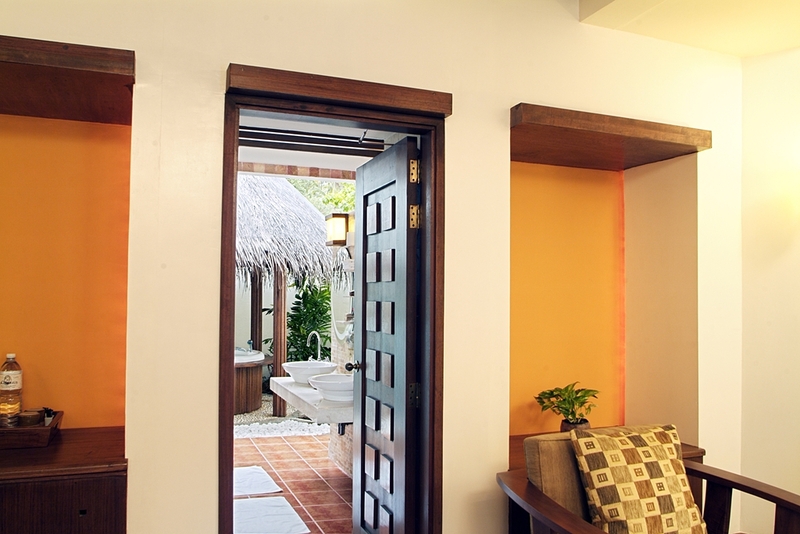 Perfect for people who wants escape the noisy and busy life in the city. You will get to appreciate the beauty of simplicity. 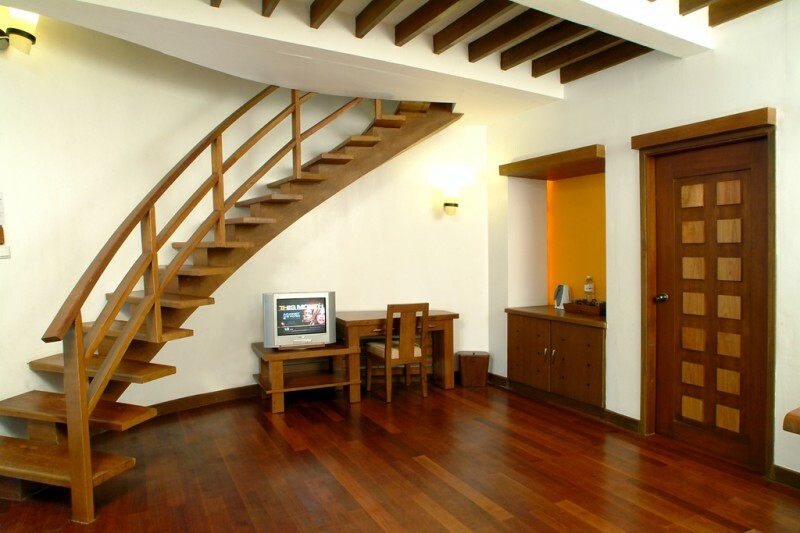 Nothing is too grand at the island, the guest rooms have wooden floors and simple designs. The resort have everything that the guest needs. The management made sure that no one gets bored at the island. For guests who are food lovers there are different restaurants to choose from, for adventurers there are plenty of water activities and there is a bulletin board letting you know the schedule when you can participate. For people who just wants to stay indoors there is a pool with bar where they can relax while having a good drink. 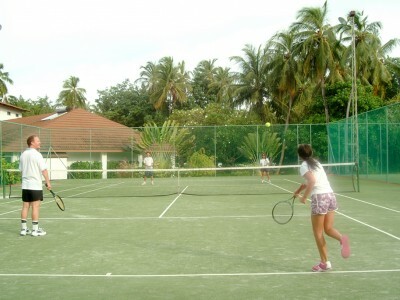 For energetic guests, sports facilities are available such as table tennis, badminton, soccer and even gym. Guests with kids can still enjoy themselves as kids playground is available and carers can look after their child if they want to have some alone time. Overall Bandos Island is a complete package. A proof that a great time doesn’t need to be too grand or expensive. Остров, на котором расположен отель Bandos Island Resort & Spa поражает своей красотой. Это тот случай когда возраст курорта играет ему на руку. Ведь за почти 50 лет своей работы мы видим прекрасно сформировавшиеся сады, не типичные для Мальдив хвойные деревья, помимо традиционных пальм и многие другие экзотические растения, которые вырабатывают приятный аромат по всему острову. Хотя номера не новые – нет ощущения устаревшего помещения из-за традиционной стилистики тропического бунгало. А Jacuzzi Beach Villa прекрасно подойдет молодоженам, номер имеет 2 этажа и напоминает по форме кокос; с тыльной стороны домика расположена открытая ванная комната с джакузи и тропическим душем. Практически все категории номеров имеют прямой выход к пляжу а тропичекие растения разделяют пляж на отдельные зоны и создают уединенную атмосферу. Один из главных плюсов острова – он окружен рифом, так что в любой части острова у вас будет прекрасная возможность заняться снорклингом. Большинство общественных зон отель реновировал или заново построил. 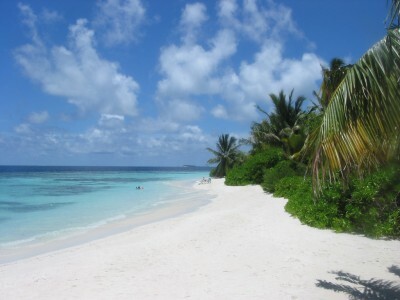 Так что Bandos Island располагает одним из крупнейших современных дайвинг центров, огромный спортивный центр с теннисными кортами, детскими площадками, новыми душевыми и раздевалками. Кстати, если у гостей вечерний вылет – они могут освободить номер, оставить вещи в камере хранения и купаться в океане до последнего. А непосредственно перед вылетом – освежиться в душевых и привести себя в порядок в спорт центре. В отеле пока работает 3 ресторана: основной, a la carte и небольшой уголок востоыной кухни – для особых случаев. Если родители собрались на этот особый случай оставить ребка с няней или на пару часов в детском клубе – пожалуйста. Для детей от 3 до 11 лет клуб Kokko работает бесплатно в дневное время. А для младенцев до 3 лет – предлагают услуги платной няни в новом оборудованном помещении. Если Вы не хотите тащить с собой коляску-трость – тут ее можно взять в аренду. С другой стороны острова – в тишине и покое находится Orchid Spa – тайсикй оазис и настоящая жемчужина отеля. Територию спа отделяет цветущая растительность и пруд с красивыми рыбами. В общем – идеальное место отдыха! Ну, а если необходимо совместить приятное с полезным – в отеле есть конференц-центр на 200 человек. Если Вы ищите красивый недорогой отель для отдыха семьей или место проведения конференции недалеко от аэропорта, Bandos Island Resort – наша рекомендация. The island on which the hotel Bandos Island Resort & Spa is located is amazes of its beauty. This is the case when the age of the resort plays into his hands. 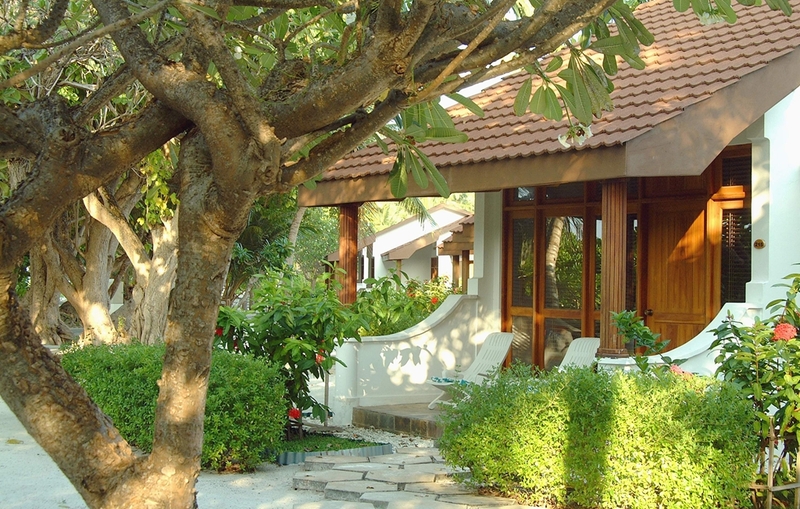 After almost 50 years of its work, we see perfectly formed gardens, not typical for the Maldives coniferous trees, in addition to traditional palm trees and many other exotic plants that produce a pleasant aroma throughout the island. 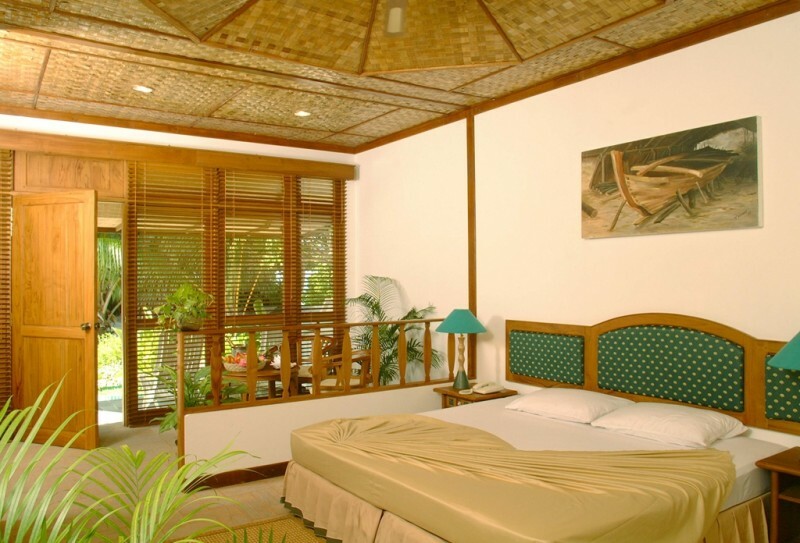 Although the rooms are not new – there is no feeling of an outdated room because of the traditional style of the tropical bungalow. 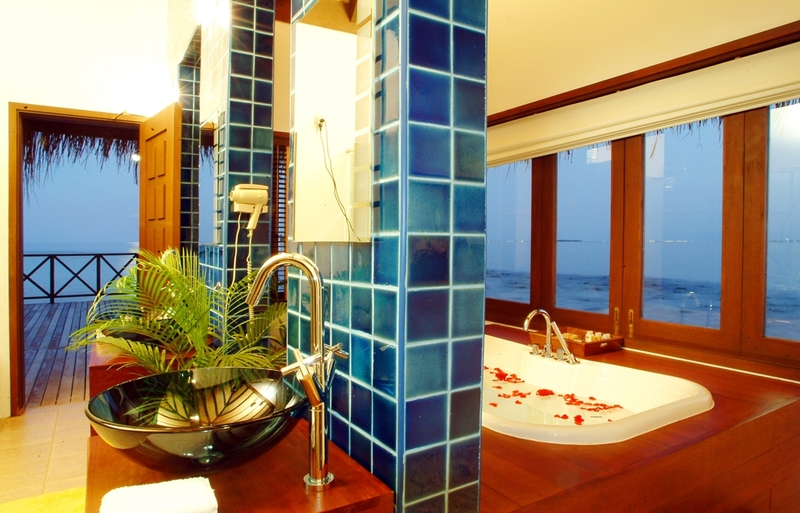 And Jacuzzi Beach Villa is perfect for newlyweds, the room has 2 floors and resembles coconut shape; On the back of the house there is an open bathroom with a Jacuzzi and a rain shower. 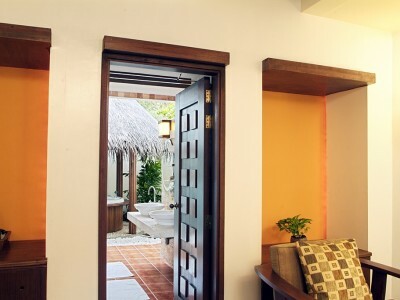 Almost all categories of rooms have direct access to the beach and tropical plants separate the beach into zones and create a secluded atmosphere. 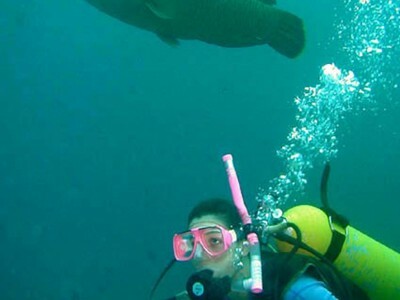 One of the main advantages of the island – it is surrounded by a reef, so that in any part of the island you will have a great opportunity to do snorkeling. Most of the public areas of the hotel are renovated or rebuilt. So Bandos Island has one of the largest modern diving centers, a huge sports center with tennis courts, playgrounds, new showers and changing rooms. By the way, if guests have an evening flight – they can release the number, leave things in the storage room and swim in the ocean to the sunset. And just before the flight – refresh themselves in the showers in the sports center. 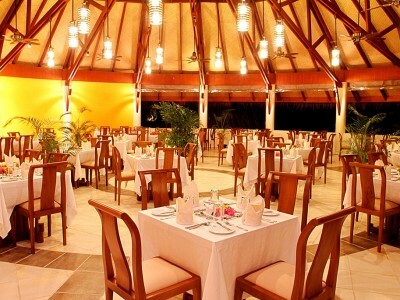 In the hotel operates 3 restaurants: the main, a la carte and a small corner of oriental cuisine – for special occasions. If the parents have gathered for this special occasion to leave the baby with a nanny or for a couple of hours in a children’s club – please. For children from 3 to 11 years old, the Kokko Club operates free of charge in the daytime. And for babies under 3 years – hotel offers a paid babysitting service in a new equipped room. If you do not want to carry a stroller, you can rent it. 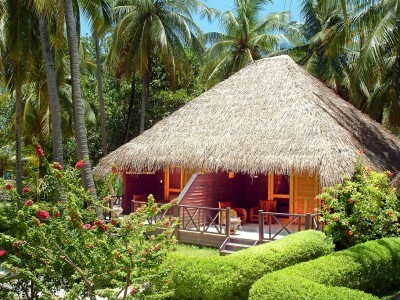 On the other side of the island – in silence and peace is the Orchid Spa – a Thai oasis and a real gem of the hotel. The spa area is separated by flowers and a pond with beautiful fish. In general – it is an ideal holiday destination! Well, if you need to combine business with pleasure – Bandos hotel has a conference center for 200 people. 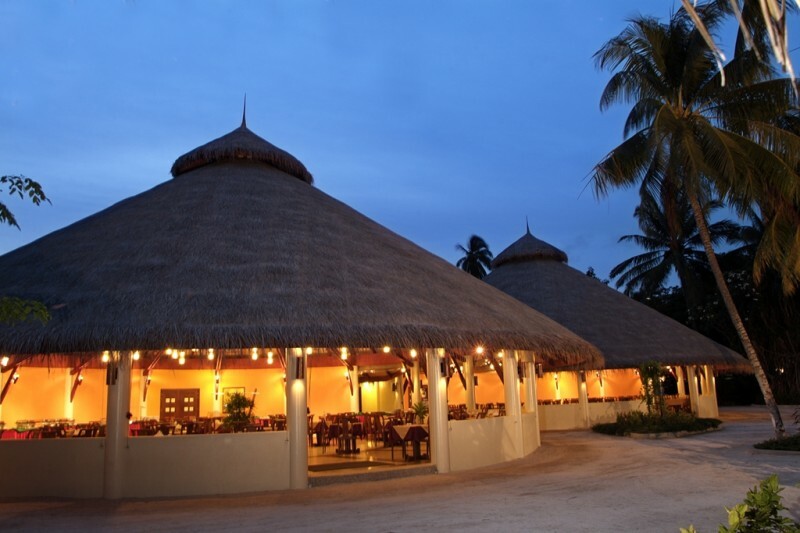 If you are looking for a nice budget hotel for a family vacation or a conference venue near the airport, Bandos Island Resort is our recommendation.